Last week we spent as much time at the allotment as we could. We wanted to complete as much tidying and digging as possible before the weather turned wet. 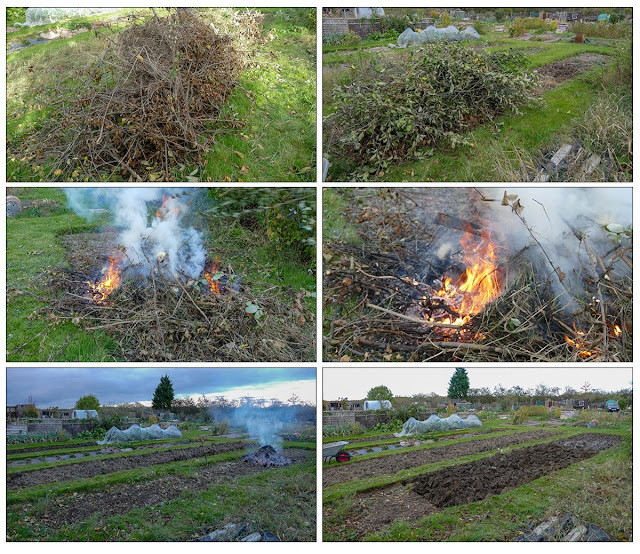 One of the priorities was to burn a large pile of dried prunings. If persistent rain came before this was done, burning wet material would take far longer and be far more smoky. Not only did we manage to quickly burn the huge pile of debris, Martyn also managed to dig over the bed where the prunings had been stacked. It was one of the beds that couldn't be dug over last year due to the ground becoming rock hard before we got around to it. We dug over quite a few other beds last week. Martyn, worked on one bed that had been neglected for a few years. The clods of soil wouldn't break down so we hope that the winter weather will help with this. It's likely that we will grow potatoes here next year. The beds that I dug over were smaller and not as hard going, which is only fair as I am a lot smaller(and weedier) than, Martyn. The bed above housed peas and once dug over was recovered with weed control fabric and wood chippings. I did have to barrow six loads of chippings from our communal pile and so wasn't slacking. This part of the plot has mainly fruit trees and our 'perennial' flower border. This leaves only the four beds above for cropping. The two beds on the right are sown with green manure and the bed in the background on the left had already been dug which means this area is ready for its winter rest. I also dug over also this year's broad bean bed shown on the right above. The bed on the left was a joint effort, I got out the weeds and, Martyn dug it over. Many beds in the area covered by plot 30 were very neglected last year. It was the last part of the plot on the list for digging over and by the time we got round to it the ground was unworkable. At first it was too soggy and wet and then quickly became like concrete. We've managed to get most of the area sorted out this year. Just out of shot, behind me when I took the above photo is the only part that needs attention. It's another part of the plot that has been neglected over the years. Hopefully weather permitting, this will be the year that it is rescued. There are still quite a few beds that need digging over and it will depend on how kind the weather is as to how many we manage to complete. Compared to last year, however, when illness prevented us from getting to the allotment during September and October we are happy with what we have achieved so far. We didn't really harvest very much last week. This is mainly as we are at the stage where we harvest as we need. I dug some leeks on Monday and also, whilst generally tidying the autumn raspberry bed, I noticed a few berries good enough to pick. Friday I dug more leeks, this time for my sister, and also picked more autumn raspberries. The statice had produced more flowers so I picked these for drying. The temperature fell quite a bit at the weekend and there was even snow in some higher parts of Yorkshire so it looks as though it won't be much longer before we can discover whether our parsnips are all top growth or whether they have rewarded us for all the work watering and produced some good roots - can't wait! Last week we made a couple of visits to the allotment. 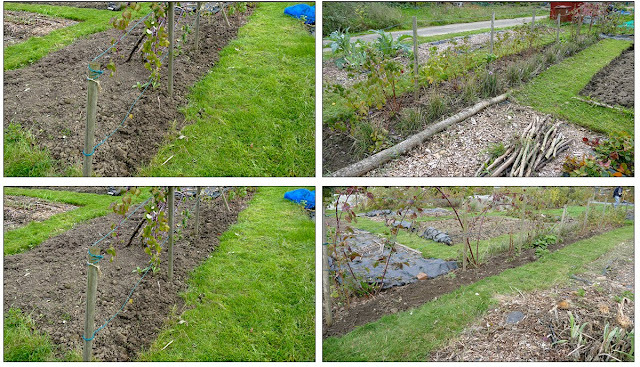 As in previous weeks recently much of our time there was spent clearing and tidying beds. The area below had been a large square bed but we found that the central area became very compacted due to us having to walk on the soil to harvest so we made the decision to split it into two with a path down the centre. The two beds have been roughly dug over and now we just need the winter weather to break down the clods of soil. Generally, as the trees and bushes are gradually losing their leaves, the plot will soon take on its bare winter look. Most of the beds have now been cleared of their summer residents. There is lots of general tidying up to complete before wintry weather sets in. Around the fruit canes it was more or less a case of clearing any weeds from around the plants before they became too comfortable and difficult to evict. Then there are some neglected areas that we are hoping to bring back into production. Clearing these areas is going to take more effort and be a longer job. We have tried to tackle a couple of overgrown areas before and each time the weather has scuppered us. Let's hope that this is the year when the weather gods play nicely and help us complete the task. We've been harvesting carrots for a few weeks now but these have all been the variety Early Market, just one of the three varieties we are growing. Last week we decided to dig a few samples from the other two varieties in order to ascertain whether they were going to prove as successful. We were not disappointed. 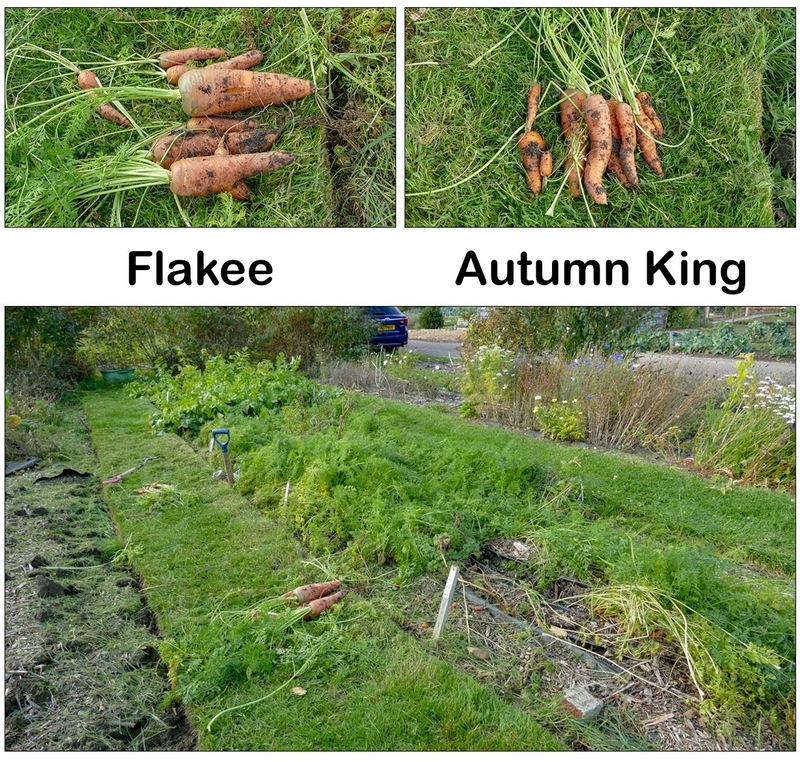 Martyn has posted about how we grow our carrots including a video of last week's reveal. You can read it here. Every time I cut some dahlias, I expect them to be the last but the plants are still hanging on. I even managed to find a tiny posy of sweet peas. If you look closely at the leeks below, you may be able to see that leaves of the row on the far right are turning yellowish. This variety is Below Zero F1 and we did wonder whether these leeks were going to be worth harvesting. Fortunately they were fine so we harvested a couple. Like the carrots we harvest leeks as we need them. As for the two tiny tomatoes in the photo above, these were mysteriously found alongside the leeks.